When most of us think of a typical farm, we probably imagine sprawling fields in an idyllic countryside, but many farmers have made a go of it in unexpected, underutilized, and challenging locations, sometimes within or on just outside of urban centers. Last Sunday, CUESA organized a tour to two Ferry Plaza farms in unique spots within an hour of San Francisco. 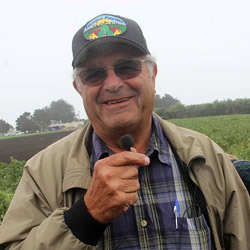 At Iacopi Farms, Louis Iacopi grows shelling beans, peas, and artichokes on more than 150 acres of leased land scattered around Half Moon Bay, between the Santa Cruz Mountains and the ocean. The son of an Italian immigrant farmer, Louis grew up on a 6,000-acre farm in nearby Pescadero, and in 1962, he set up his own operation. 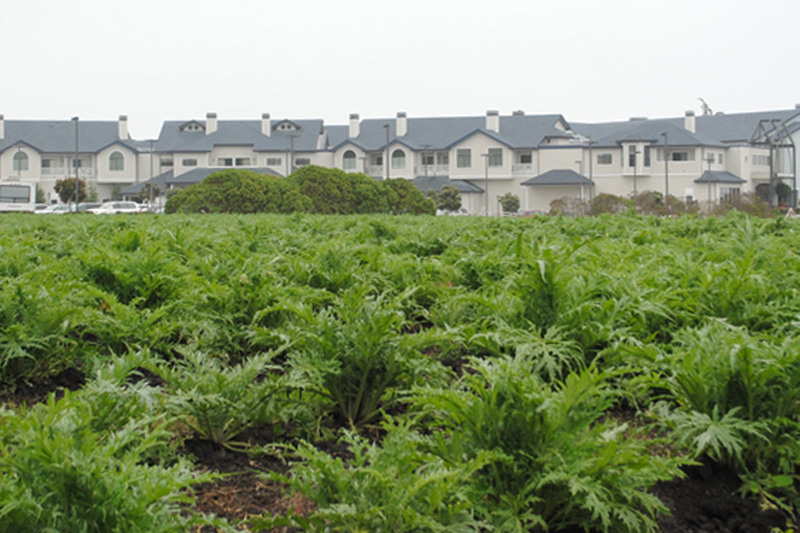 We visited two of Louis’ sites: a 20-acre plot adjacent to a hotel and a collection of small plots at the Half Moon Bay Airport. Being on the edge of civilization is both a blessing and a challenge for Louis. “It’s nice being close to town, but it can be hard to farm,” he said. The owner of the hotel also owns the property that Iacopi Farms leases, and Louis and his workers must be careful not to work the land on windy days, in order to avoid blowing dust toward hotel guests or a wedding party. The airport site has no available water, so Louis dry-farms his beans there, relying on winter rains to keep his plants going into the fall. Across the Peninsula, Happy Quail Farms is a lush oasis in the East Palo Alto suburbs, down the road from an IKEA and a Four Seasons Hotel. Farmer David Winsberg tends 30,000 pepper plants, plus rhubarb, cucumbers, tobacco, and other assorted crops over several acres in his neighbors’ and his own backyards and greenhouses. Having grown up on a 600-acre pepper farm in South Florida, David never thought that his path would lead back to peppers. David moved to East Palo Alto in 1978, when the area was home to a diverse agricultural community, and started raising quail, but after discovering that quail eggs were a difficult market to crack, he went back to his roots and found his niche in growing specialty peppers. He befriended a neighbor and fellow gardener, Mr. Ichi, who allowed David to grow peppers in his hothouse, alongside his wife’s carnations. David now grows around 50 sweet and spicy varieties, from bells and Cubanelles to Cayennes and Serranos. His signature pepper is the Pimiento de Padrón, a Spanish delicacy that he introduced to the U.S. market. Mr. Ichi has since passed away, but David continues to steward the family’s property and use the 70-year-old greenhouse. 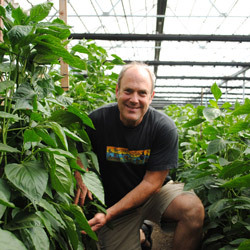 He also grows peppers in a state-of-the-art greenhouse that he built in his own backyard (retractable roof and computerized temperature control included) and on several outdoor plots in the neighbors’ backyards. The owners often let him use the land in exchange for a taste of the harvest. While the Bay Area is an unusual place to grow peppers, Happy Quail’s carefully controlled growing conditions allow the plants to thrive. Aphids, powdery mildew, and other pests occasionally threaten David’s harvest, but he combats them with neem oil, tobacco tea, and beneficial insects. “Most people say you can’t grow peppers in the same place for long, but we’ve been doing this for over 30 years,” he said. Louis Iacopi photo by Barry Jan.